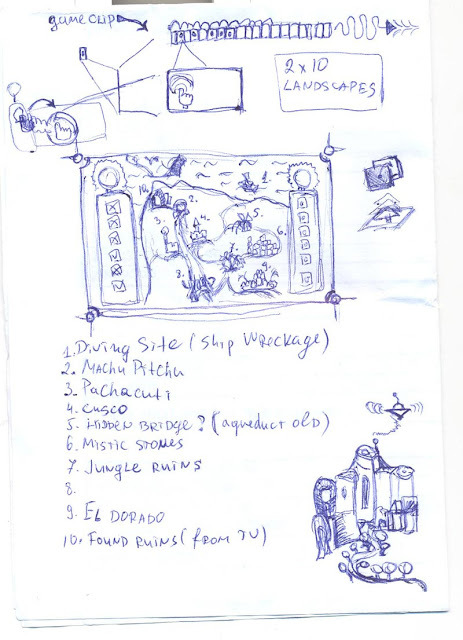 This is the initial schematic for the new archaeology game about the lost treasure of the Incas. I love playing Inca empire on Civ 5 and watching movies about their lost treasure. Here is what I plan: There will be 10 items to be fount in 10 locations relevant to the Inca empire and achievements. They will be marked on the map with some small icons. Every location will hold two images - the first one will unlock the second one, but if the player have the proper item. There will be 10 items found on the first image in a form of hidden object somewhere on the landscape picture. They will be used with drag and drop over the correct place on the image. For example, the first picture on the Ship Wreckage site will be a shore, a sea and a boat. Drag and drop the diving suit(an initial item) on the boat will show the second picture of a sumken ship. Somewhere on the image there will be a small golden cup to be clicked and collected. When all 10 items are collected the game ends and rewards a new knowledge level. 7. El Dorado + treasure city / a legend for a site in the heart of s. america. 8. Chan Chan + sand ruins / Chan Chan is located in the mouth of the Moche Valley.